Item #RQBE-70: Avg. 6" tall Rose Quartz bookends. 7.00 - 7.99 lbs. TW. Item #CPR-BE-300: 9 3/4" x 6 1/4" x 1 3/8" Lacquered Float Copper Bookends on 1" tall Wood Base; 17.12 lbs. T.W. 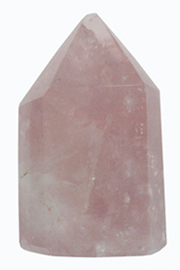 Item #RQ-OBL-20: 4"-5" tall Rose Quartz Obelisk. Item #RQBE-50: avg. 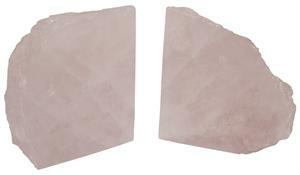 5" tall Rose Quartz Bookends. 5.00 - 5.99 lbs. TW. Item #RQBE-60: avg. 6" tall Rose Quartz Bookends. 6.00 - 6.99 lbs. TW. 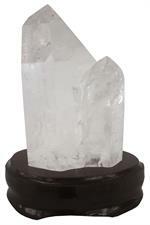 Item #BQ-XTL-10: 3 1/2"-6" Brazilian Quartz crystal point. Item #AM-DBL-QTZ-50: Approximately 4"x1.75"x1.5" Double terminated Quartz crystal from Brazil. 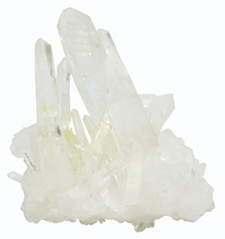 Item #AM-DBL-QTZ-65: Approximately 1 5/8"x3/4"x2" Double terminated Quartz crystal cluster. 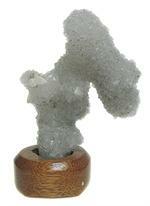 Item #AM-DQ-150: 5"x5.75" tall Drusy Quartz on 1.4" wooden stand. Item #AM-LQC-10: Approximately 5/8"x6/8"x2 3/8" Lemurian Quartz crystal from Brazil. Item #MS-225: Approx. 14"x12"x3.5" Manganocalcite on Quartz with Pyrite (Manuelita Mine, Peru) of 26.70 lbs. Item #MR-QXTL-10: 1 lb. TW of Mine Run Quartz crystals ranging in size from .5"x1.5" to 1.5"x2"; 15+ pieces per lot. Item #MS-308: Our points are transparent with slight internal inclusions. The six-sided points are unpolished. The 6" natural Quartz points are from the Jequital Mine, Minas Gerais, Brazil. Specimen is approx. 6". Item #AM-NAT-QTZ-150: Approx. 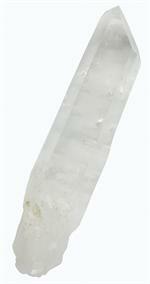 7 3/8" natural Quartz Crystal wand (Brazil). Item #MS-243: From Brazil; 6"x25.5" tall on 6" wood base; 52.55 lbs. 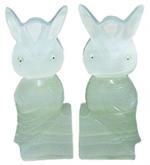 ; translucent to opaque; (delivered price). Item #MS-902: 4 3/4" tall Pseudo Quartz after Anhydrite specimen from Rio Grande Do Sul, Brazil. Item #QC-1: Arkansas Quartz Clusters. Approx. 1"-2". Item #QC-2: Same as QC-1 Crystal but bigger. Approx. 2"-4". Spread of cluster will be wider, with up to 20 crystals in the forest. 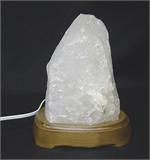 Item #MS-393: The soft light is filtered through an approximately 4 x 6 tall chunk of Rock Crystal Quartz. 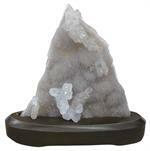 The Quartz has smooth surfaces and sits on a 1.5 tall wood base. Item #MS-884: Quartz cluster of .60 lbs. Approx. 2.25"x3.25". Item #MS-961: Approx. 5"x7"x4" Quartz Crystal Cluster (Corinto, Minas Gerais, Brazil). 3.80 lbs. 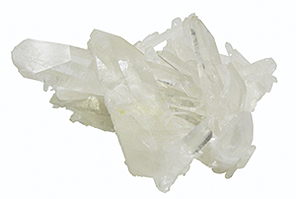 Item #MS-981: Quartz cluster of approx. .60 lbs. Averages 3"x5.5". 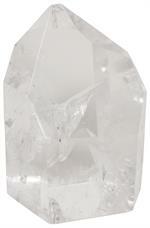 Item #MS-982: Quartz cluster of approx. .60 lbs. Averages 2.25"x5.25". 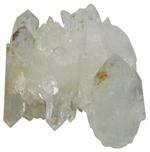 Item #MS-983: Quartz cluster of approx. .85 lbs. Averages 3.25"x5". 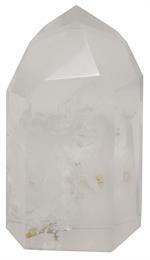 Item #MS-984: Quartz cluster of approx. .60 lbs. Averages 3"x3.5". Item #MS-985: Quartz cluster of approx. 1.10 lbs. Averages 4.25"x5.25". 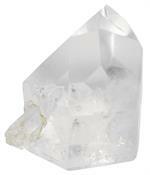 Item #MS-986: Quartz cluster of approx. 1.10 lbs. Averages 3"x5". Item #MS-950: Approx. 5"x3" Quartz crystals (Brazil) on wooden stand. 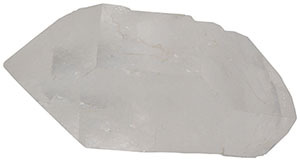 Item #AM-QTZ-PH-50: Approximately 2 3/8"x1/2"x1 1/2" Quartz crystal with phantom from Brazil. 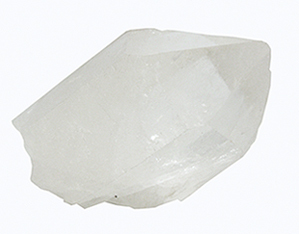 Item #AM-PQ-75: 1.25"-2.5" Polished Quartz Crystal with phantom inclusion (Brazil). Item #AM-PQ-50: 1.75" Polished Quartz Crystal with phantom inclusion (Brazil). 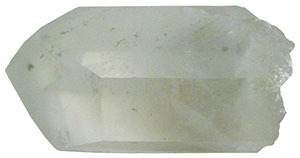 Item #AM-PQ-75: 1.5"-2" Polished Quartz Crystal with Quartz inclusion (Brazil). Item #AM-QTZ-RT-50: Approx. 1.5"-1.75" Polished Quartz Crystal with rutile inclusions (Brazil). Item #MS-953: Approx. 8"x6 1/2"x1" Quartz Specimen with Pyrite and Sphalerite. Item #AM-RQ-CH-15: 3" to 5" long Rose Quartz Chunk from Brazil. These pink chunks have some translucency when held to a light. Item #AM-RQ-CH-20: 4" to 6" long Rose Quartz Chunk from Brazil. These pink chunks have some translucency when held to a light. Item #MS-547: 2.5" - 3" tall Polished Rose Quartz Point. 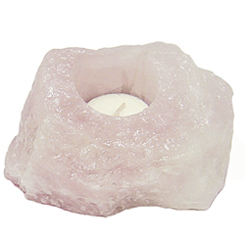 Item #MS-548: 3" - 3.5" tall Polished Rose Quartz Point. 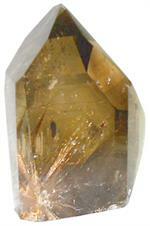 Item #MS-232: 6"x4"x10" transparent Brown Quartz crystal of 15.75 lbs with Gold Rutile needles.